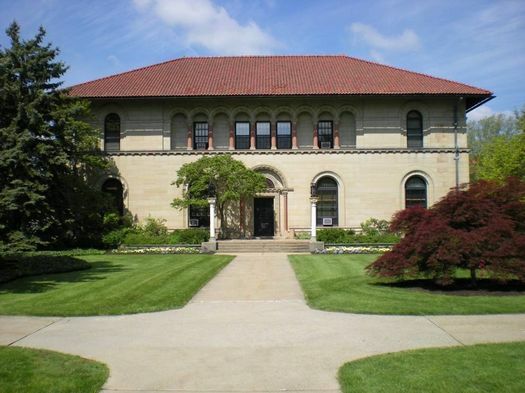 The Cox Administration Building, begun in 1913 and completed in 1915, was Gilbert's second structure on the Oberlin campus, and marked the turning point for Gilbert's influence on the college's campus design. There had been two factions within the campus administration, one supporting Gilbert's vision for the campus and another in support of competing architect Joseph Lyman Silsbee's scheme. [Blodgett-1985 p 24] Chicago architect Joseph Lyman Silsbee (1848-1913) was senior to Gilbert, and had a longer history with the Oberlin campus. Silsbee designed the Memorial Arch (1903) and the Men's Building (now Wilder Hall, 1911). His campus plan would make the Memorial Arch the focal point and entry to the campus, with a north-south axis running from the arch though the center of Tappan Square. Tappan Square would be filled in with several campus buildings, centered on a large Administration Building featuring a pedestrian passageway through it. On the other hand, many campus trustees and the Oberlin College President Henry Churchill King backed Gilbert's plan, which was inspired by and elaborated an earlier plan by the Olmsted Brothers of Boston, the sons of famous landscape architect Frederick Law Olmsted. The Gilbert-Olmsted campus plan, in sharp contrast to Silsbee's, called for the complete removal of all structures from Tappan Square, creating a central park at the heart of campus. The campus would be laid out with a highly formal structure of orthogonal lines; and buildings would all be constructed in one unifying Mediterranean-inspired style. Oberlin Memorial Arch, by architect J.L. Silsbee Historic postcard of the Memorial Arch, Oberlin College.